If you want a job done properly, do it yourself, right? That appears to be the approach DivX is taking by developing its own reference design for a media streaming box which will also tie into the company’s online video destination, stage6. Code-named GejBox, the device is designed to deliver online video via your PC onto your living room television, and features WiFi and Ethernet networking as well as Component, S-Video and HDMI video out. 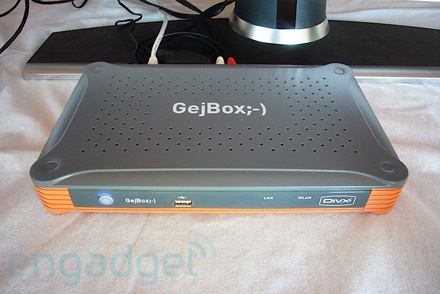 Though the GejBox platform will compete with other media extenders such as the AppleTV, XBox360, or even Sony’s PS3, it differs in a number of ways, both technically and strategically. NewTeeVee reports that the device has no hard disk or fully-fledged CPU, and instead the connected PC handles most of the work by converting its display data into a DivX video stream which can then be decoded at the other end using the GejBox’s built-in DivX chip. The fact that the device doesn’t need additional processing power or storage should make it a lot cheaper than its competitors. Also because the PC re-encodes the data before it’s sent to the GejBox, it should be possible to display any content on your TV that originates from a PC, including iTunes downloads or video podcasts. The GejBox software could also end up being an open platform where third-party developers can write plug-ins to enable new functionality and support for additional video formats. For example, when DivX demoed the device at Pixelodeon earlier in the week, they showed it pulling in content from Google Video. This would be in direct contrast to more closed platforms such as the AppleTV or XBox 360 which are limited to the video formats that come supported out of the box (see our recent post ‘When will Steve Jobs open up the AppleTV?‘). Although DivX is unlikely to release the GejBox itself (remember it’s a reference design only), the platform looks promising — especially with its low-price point and open strategy — so hopefully the company will be able to persuade a number of its partners to bring the device to market.